David “Dave” Loeffler, Hayfork Volunteer Fire Department chief since 2008, has decided to hang up his turnouts after 42 years of dedicated service. Starting with the Hayfork Volunteer Fire Department in December 1973, Dave began as a firefighter. Throughout the years he became qualified as a fire investigator and engineer. From 1984 through 2008 he took over as an assistant chief. Then, in 2008, he was elected as chief of the HVFD, a position he held until his retirement on May 31. 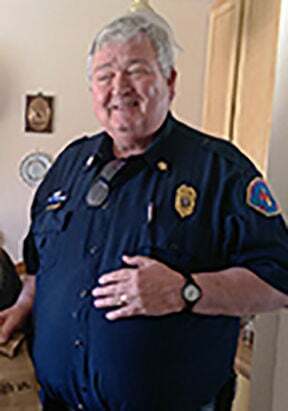 His devotion to the community of Hayfork has been continually shown with an uncountable number of responses to structure fires, wildland fires and medical aids. Born in Hyampom, Loeffler began working for the U.S. Forest Service in 1966 out of high school. In 1968 he was drafted into the U.S. Army and sent to the Vietnam War were he was awarded the Purple Heart. After returning from Vietnam he continued his service in the Forest Service were he wore many hats, most of which were in the wildland fire realm. The HVFD accomplished many things during his tenure, one of which was working with members of the community to help develop and pass Measure F. This allowed for the department to purchase turnouts, update training material and purchase medical equipment. Funds are used to replace much needed out-of-date equipment and allow for upkeep of the newly acquired equipment. A U.S. Department of Agriculture Rural Development grant, along with loans and donations, was a key factor to the construction of the new Hayfork Public Safety Facility. This building will eventually house both fire and EMS apparatus and employees. The HVFD has also received multiple new vehicles, the two biggest being the fire engines, a type 1 structure engine and a type 3 4x4 wildland engine. A duty chief vehicle and fire rescue vehicle have been purchased to aid in emergency responses as well. Loeffler’s community service hasn’t all been with the HVFD. He was a reserve deputy for the Trinity County Sheriff’s Office, president of the Fire Chiefs Association, secretary for the Hayfork Lions Club and a lifetime member of the Hayfork VFW.